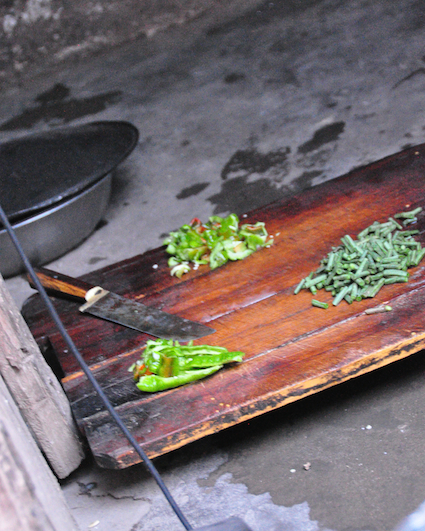 A cat seen on the first day in Kashgar. We all had a great laugh. 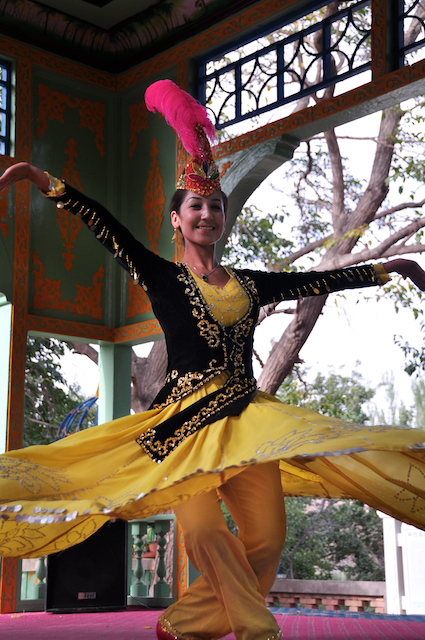 Exotic and eclectic, 2 fitting words to describe Kashgar. 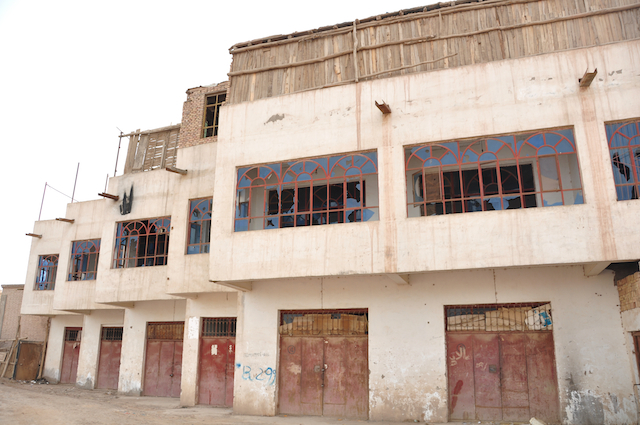 Eclectic in the way that it is divided into modern, rapidly developing zones and enclaves of old buildings dating to several centuries ago. The old, new and all in between coexist. 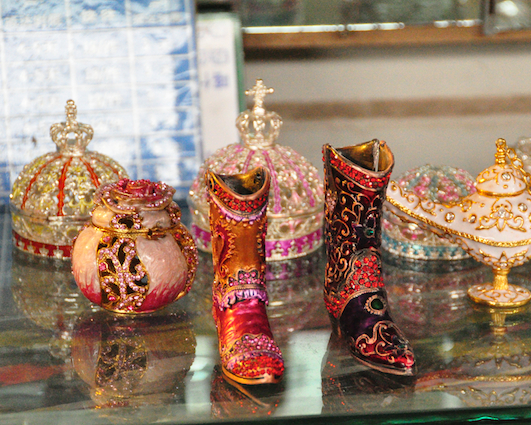 Exotic in the cultural and religious past that still has a mark today. 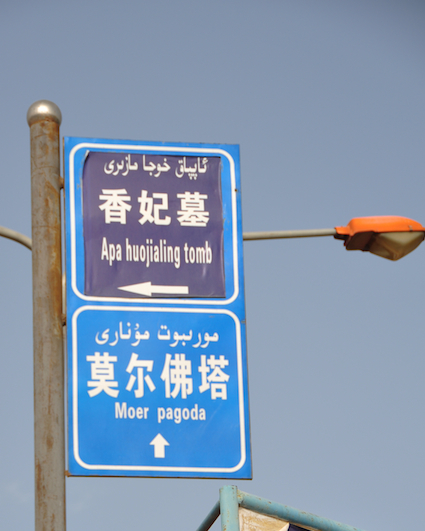 Sign pointing to the Buddhist Moer Pagoda and the Abakh Hoja Tomb. 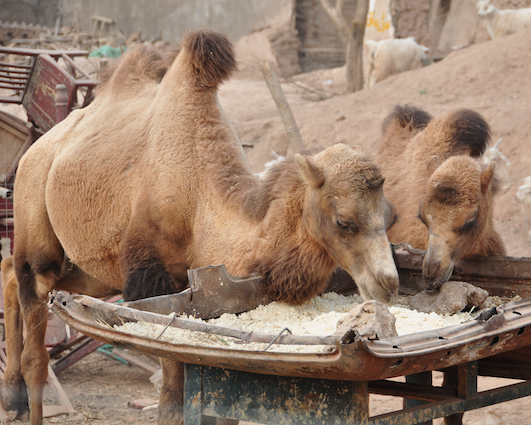 Clearly, the people of Kashgar have seen the influence of Buddhism in the past and Islam in the present. 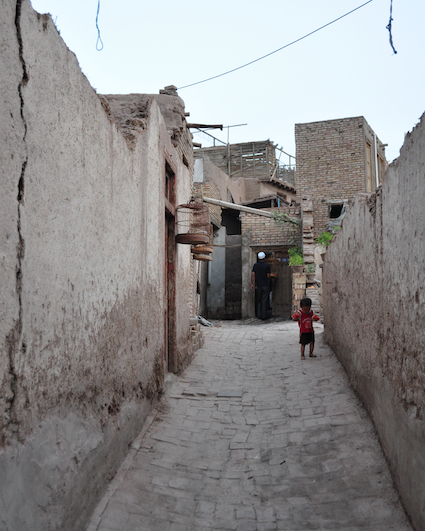 Today, Kashgar is in a physical transformation that is changing the city, yet parts remain relatively permanent and unchanged. 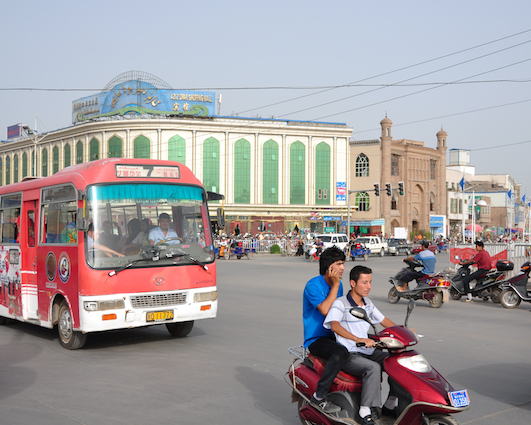 Mix and meeting of the old and new development in Kashgar. 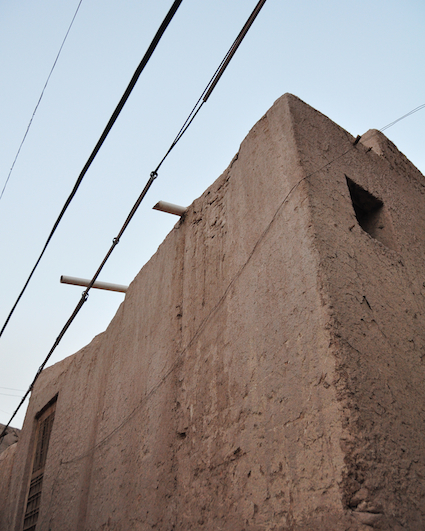 A traditional building in Kashgar. 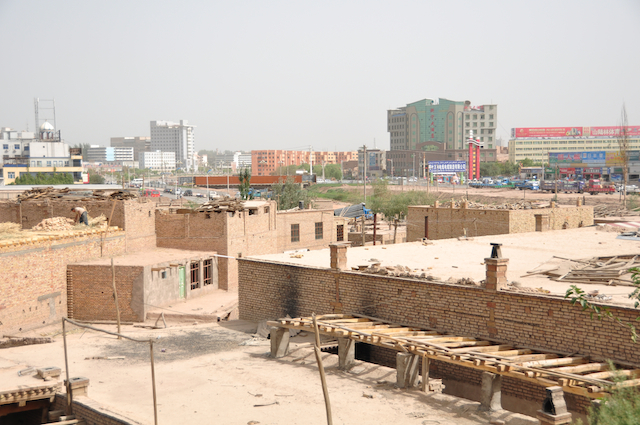 A block of buildings in Kashgar. 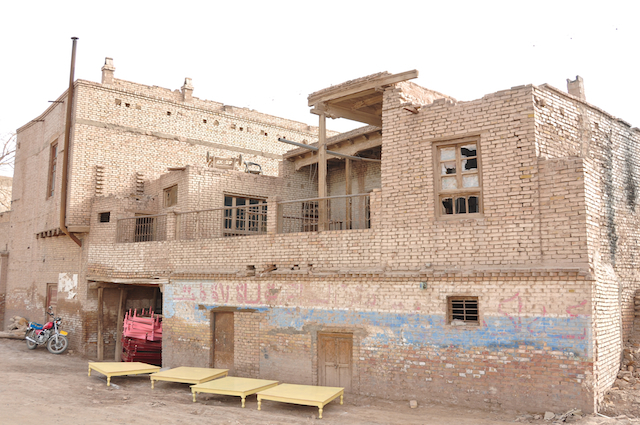 The old parts of Kashgar are the attractions of the city. There exists still the timeless way of life in the narrow allies and houses outside of the high rise apartments and modern housing units. 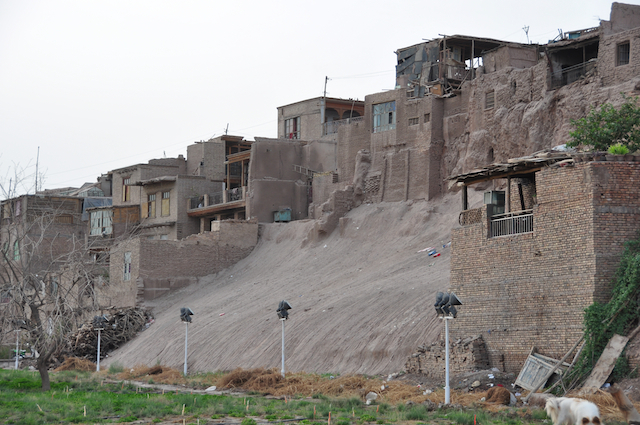 Green grass and the Kashgar old town. 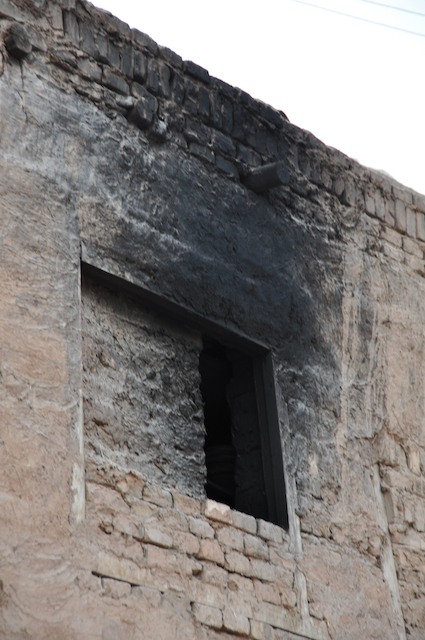 One corner of the old town residences. 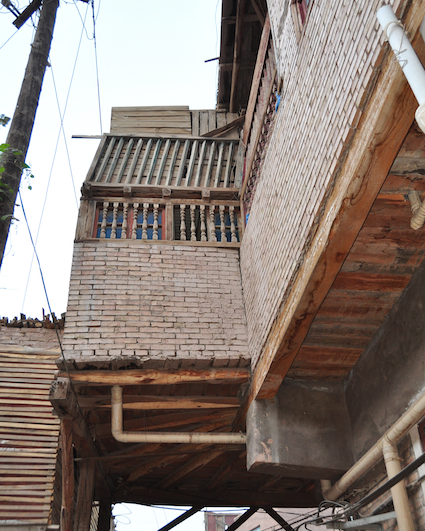 Architecture in Kashgar's old town. 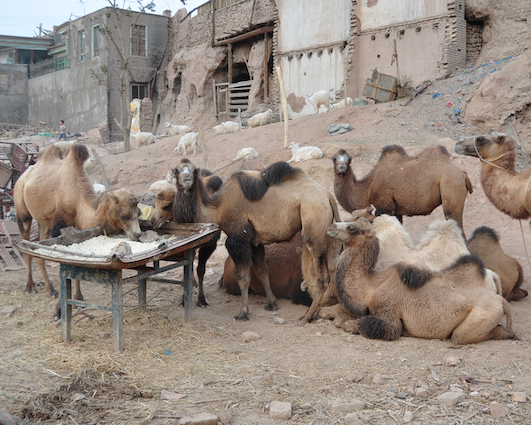 Camels raised at Kashgar's old town. 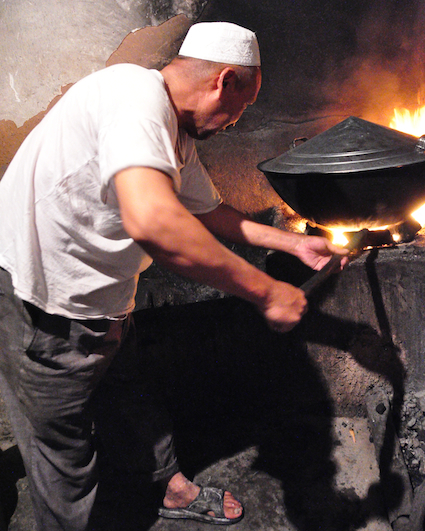 Cooking time after sunset during Ramadan, in the Kashgar old town. 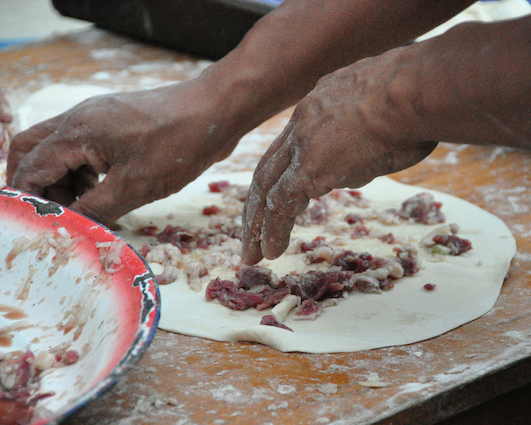 Preparing a meal in Kashgar's old town. 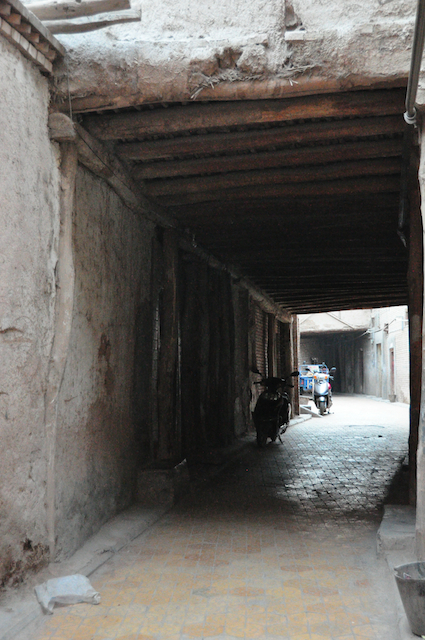 Inside the old town of Kashgar. 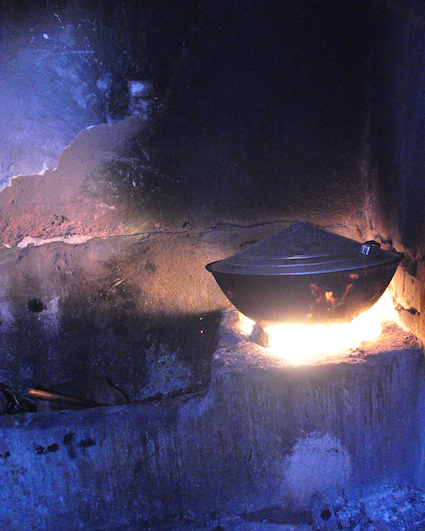 Old town, traditional heating method. My friend Mahmood and I at Kashgar's Id Kah Mosque. The only regret in my visit to the Kashgar region is missing Shipton’s Arch, the largest natural stone arch in the natural world estimated to be the same height as the Empire State Building in New York City and was featured in National Geographic. 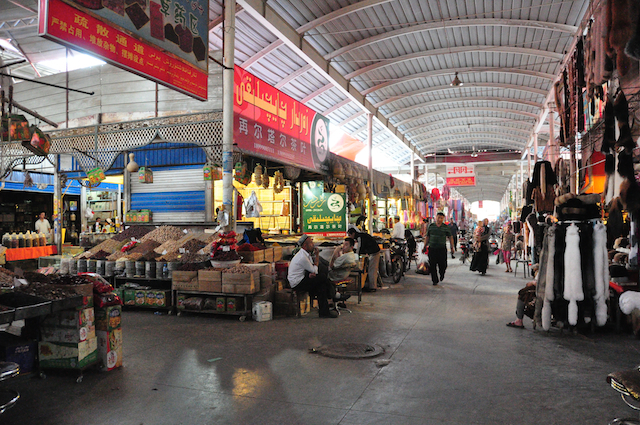 As I had purchased a departing bus ticket, I proceeded in my plans to continued my return journey to Ürümqi and then to Dunhuang before heading home. 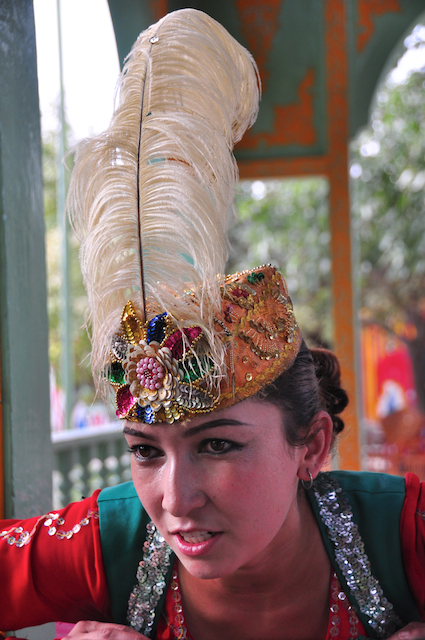 This entry was posted in Uncategorized and tagged China, Kashgar, travel, traveling, Xinjiang, 喀什, 大陸, 新疆, 旅遊, 旅行, 中國. Bookmark the permalink. 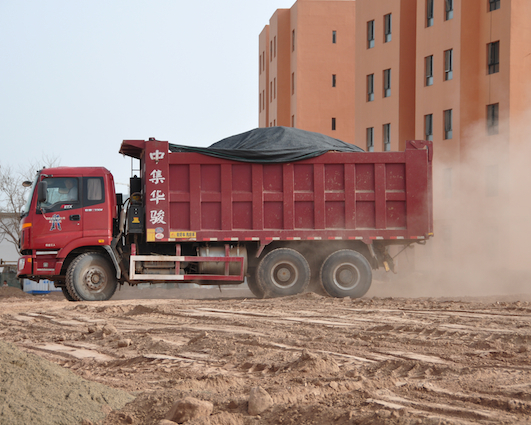 Thank you for your generous public service in posting this Blog on Kashgar. 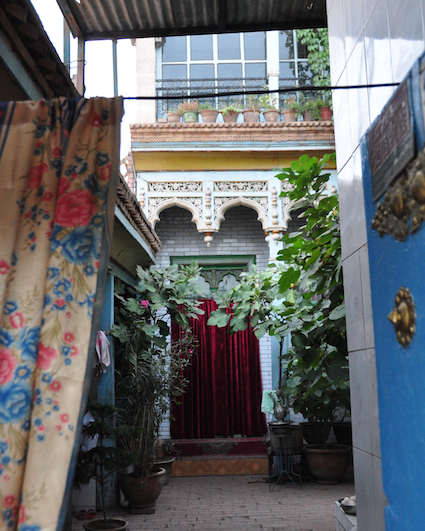 Some of the photos help to recognize, appreciate, preserve and promote important wisdom, precedent, history, sustainability and earth architecture of surviving sections of the Old Town. which will attract ecotourism and generate income for local people, something modern concrete developments cannot do. 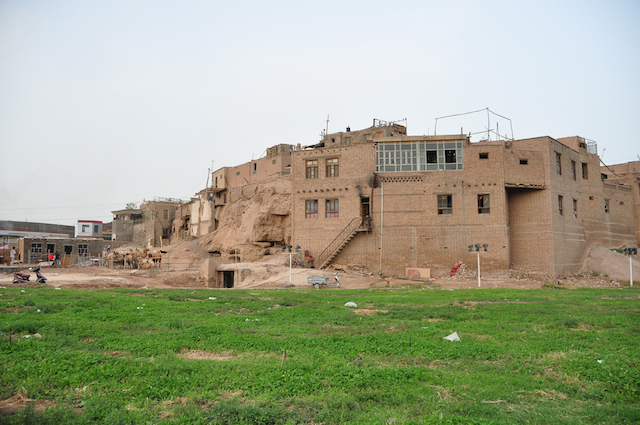 The section entitled “Green grass …Kashgar old town” was closed for renovations on Oct. 7, 2010. Did you get inside? We had a great tour of the another section of the Old Town. Is there any more written information? I did venture into part of the old town that is within a border of grass, but I did not know if it is the section you are referring to. 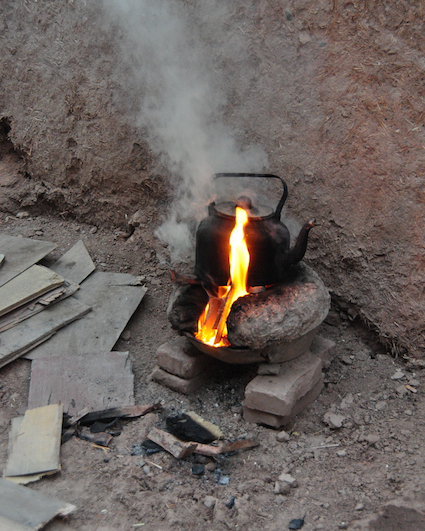 I do have some more photos and thoughts on and from Kashgar that have yet to be shared; they will come up as soon as they are organized. Thank you for the comment!